I am so happy it’s May! I’m going to celebrate by talking about … board games! I’ve been playing board games since I was a little kid. I started out with Hi Ho Cherry-O and Sorry, graduated to Monopoly and Pay Day, and then played Dover Patrol, Risk, and D-Day with my dad. For several years I was a bridge aficionado (although alas, I am without a bridge group right now). And a couple of years ago I started going to a weekly board game night, so now I think about board games more than ever. My gaming group. They are fantastic! I’ve loved this game (and its expansions) for a long time, and it continues to be my absolute favorite board game. It’s a semi-cooperative team game that pits the human players, who want to survive and cover a certain distance, against the Cylon players, who want the human players to die. But you often don’t know who the Cylon players are…and you can find out halfway through the game that YOU are actually a Cylon. What I love most about this game is its strong narrative and evocative atmosphere. I’m immersed in the story while playing, and it can really get my heart pumping! Also, having secret Cylons is just super fun. On the minus side, it can be intimidating for new players to learn and it can take a looong time to play. I’ve gotten to play three times recently, twice with the Pegasus expansion (although not the endgame because I’m not a big fan of it) and once with the base set. One complaint I’ve heard about the game is that the Cylons always win, something I’ve always argued against because the humans have won more often in my personal experience. But in these last three games, the Cylons have won all three times. Maybe it has something to do with the fact that in two of those games, I played a Cylon character brilliantly (and I even finally got to be a Cylon leader, hooray!). And in the third game, some of our human players were unhealthily fixated on their newfound power to put people out the airlock. But in any case, I’m looking forward to many more games, and I especially want to play more with the Exodus expansion. Anyway, I have yet to get bored with this game. You roll your dice (which represent your spaceships) and try to gain a foothold on the science fiction planet based on different combinations of numbers. If you don’t like to rely on the luck of the roll, you can invest in alien technology that allows you to have more control over your dice. And there are ways to thwart other players, particularly those who may be playing just a little too well. My main critique of this game is that it can be a bit slow going, especially in later rounds. You can’t plan your own turn in advance very well because you don’t know what you’re going to roll (and because of the game mechanics, you just can’t roll ahead). So you can have strategies in mind but not specific implementation plans, so things can get bogged down. But otherwise it’s a fabulous game. Sadly, it’s out of stock almost everywhere until its planned reprint in Q4 of 2013. On the upside, it will make a great holiday present! And until then, it is available on the iPad if you can’t wait to try it out. Space Alert is my newest game love, a timed cooperative game in which your group is trying to survive scanning missions in dangerous parts of the galaxy. It’s like a cooperative version of Robo Rally with aspects of Galaxy Trucker, and that cooperative aspect is really what makes the game for me. Each player can choose to move or do actions, and they have to coordinate where they are on the ship and who is going to deal with which threat (the threats include asteroids, saboteurs, aliens, and enemy ships). But all of your actions are decided face-down as the computer (or CD) counts down your time and introduces new threats. Then you play all the actions out to see what ended up happening. Hilarity often ensues as people fire at nonexistent threats, run out of the energy required to do the things they were hoping to do, and try to take robots that someone else has already taken. I love this game because it’s exciting and all about communication, decisiveness, and taking responsibility. It’s fascinating to see how things break down, and it’s really satisfying when the team works well together. Plus each mission doesn’t take very long, making the game very flexible in terms of time commitment. As for minuses, it’s really better with the missions being played for you on the computer, which means you need a computer and internet connection for best game play (although there is a CD for when that’s simply impossible). Dune, Eclipse, Illuminati, Arabian Nights, Race to Adventure (and Spirit of the Century, the RPG on which it’s based). What are your favorite board games right now? I’m loving Arkham Horror and Risk: Legacy right now, though I don’t get to play nearly as much as I would like. I’m looking forward to KublaCon, where I’ll actually have two or three days of non-stop gaming! I like Arkham Horror, although I can only play with someone who knows the rules well. I haven’t tried Risk:Legacy, but I am intrigued! 1. Setting a timer for 2 minutes, and each player had to complete their turn in that time period. If they didn’t, any ships they hadn’t placed go on the colonist hub or the solar converter. 2. Before a player’s turn came up, they took the number of dice they’d be rolling from the stock of extra dice we had, and rolled it (and kept it secret from other players). They figured out what to do with the roll. Things might change before their turn came up, but usually not too drastically. They just make the real dice match the dice that they rolled early on. Oh wow, I didn’t know you guys were doing that. We’d joked about getting extra dice to roll ahead, but apparently it wasn’t a joke after all! How often did people hit the 2 minute time limit? I’d say most people hit the time limit, but usually they were done making their choices by then and were just executing them. I think the time limit was kind of necessary for a 5 player game–it already takes a while to get to your turn in a 4 person game, and in a 5 person one, there’s a LOT of downtime and it can get boring. I think its length precludes playing it on game night because I don’t like to be rushed (especially if there are new players, as explaining the rules takes a significant amount of time). But I will cheer you on from the sidelines if a group of you end up playing! Not a board game, but Card Against Humanity is currently holding steady as my all-time number-one game. If you haven’t played (or wish to play! 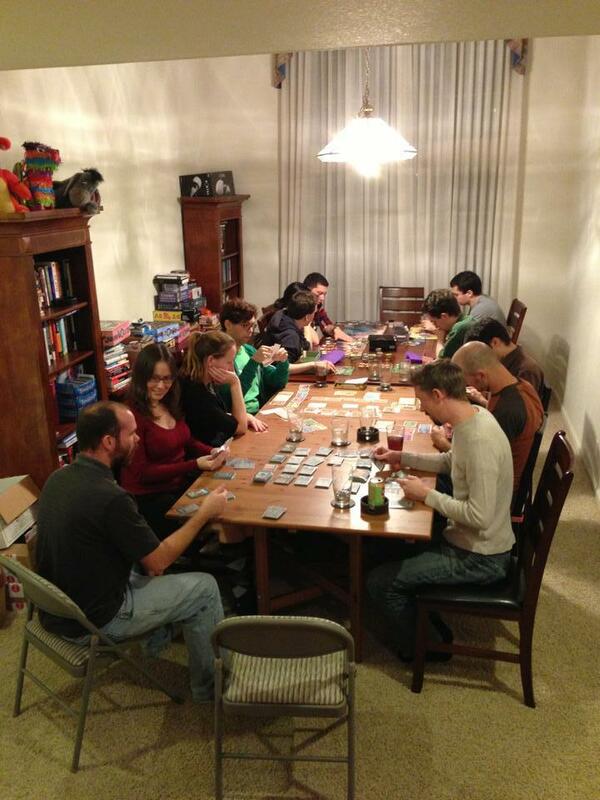 ), we need to get a CAH night together. I’ll even play Settlers if it means that we finish the night with Cards. I have played CAH many, many times, and I’m always up for playing again! We’ve been playing a cooperative card game called Hanabi lately – it hits the communication/decisiveness factors you mention for Space Alert (which we also love!) Speaking of Space Alert – there are mp3’s available to download from BGG, which you can play back on your smartphone to get the computer timed tracks – some of them are even remixes w/ classic space-themed songs. The last board game I played for the first time was Ticket to Ride, which I heard about from the Wil Wheaton youtube channel. I thought it was a fun game.